This sleek white device is smarter than its predecessor. What stands out on the positive side of the ledger is an in-app alarm silence feature for turning off alarms remotely. The tight integration with other Nest products and the ability to pair with other connected devices using IFTTT results in the Protect device setting a high bar in this product category. Nest continues to put a premium on aesthetics for its devices. The square design has round edges and a mesh cover and presents many access points for dangerous smoke or CO detection. A menu of colorful LED lights gives you insight as to the status of the device with just a quick glance. When the device senses motion, a helpful Pathlight activates helping you navigate in the dark. A built in early warning system speaks in a friendly voice to give you a chance to attend to that burnt toast before every device in your home sounds an alarm. With regular internal tests conducted by the unit itself you can always be assured the batteries and sensors are operating at peak efficiency. Multiple Protect units in your living space communicate together and all alert you to any trouble that exists. Integrations with other Nest devices are easy to set up within the Nest app. Alerts can be configured so that no matter where you are, alerts being broadcast in your home will reach you. 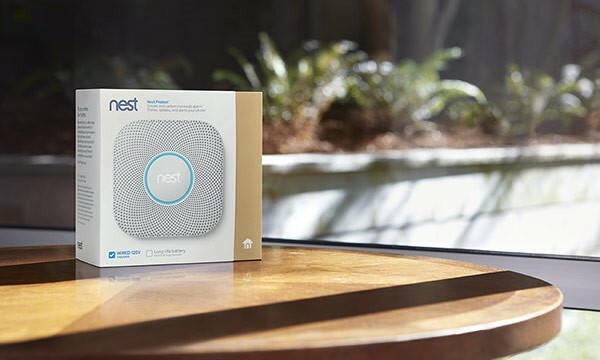 All in all, the second-generation Nest Protect is a reliable smoke and CO detector and it’s unmatched in terms of design and intelligence. When it’s time to replace your existing smoke and CO detectors, contact your local home technologist Smart Home Solutions for installation!